Wait-CIA Director Mike Pompeo Went On A Super Secret Diplomatic Mission To North Korea Over Easter? CIA Director Mike Pompeo made a top-secret visit to North Korea over Easter weekend as an envoy for President Trump to meet with that country’s leader, Kim Jong Un, according to two people with direct knowledge of the trip. The extraordinary meeting between one of Trump’s most trusted emissaries and the authoritarian head of a rogue state was part of an effort to lay the groundwork for direct talks between Trump and Kim about North Korea’s nuclear weapons program, according to the two people, who spoke on the condition of anonymity because of the highly classified nature of the talks. 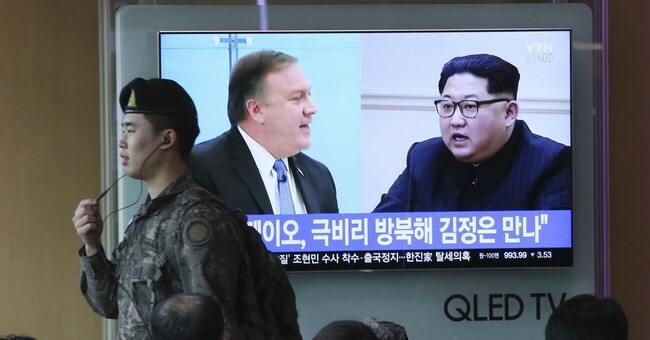 The Post added that the White House and CIA decline to comment, the meeting between the Koreas and the U.S. could occur in June, maybe sooner, and that officially ending the Korean War is on the agenda. Negotiations over denuclearization remain another top action item. South Korea has given President Trump a huge amount of credit for jumpstarting bilateral talks that defused a lot of tension on the peninsula prior to the 2018 Winter Olympics. This was partially spurred by the new sanctions the Trump White House hurled at the communist state for their missile testing and nuclear ambitions. This whole Korean affair is just odd and a bit funny. Liberals and anti-Trumpers actually thought nuclear World War III could occur because of Trump’s tweets. For a brief period, people actually took Kim Jong Un’s threats of American destruction seriously. We shouldn’t. It’s the same old crap they’ve been saying for decades—and the markets knew it as well. There was no significant slump when Trump prodded Kim, calling him rocket man, threatening massive retaliation should the U.S. be hit, and poking fun of his weight. Trump is insane. He’s unhinged. But he’s managed to bring the North Koreans to the table, another incident to be marked in the ‘Obama couldn’t have managed it’ file. Then, after all of this talk about cozying up to dictators, the liberal news media goes all soft and rosy on the North Koreans at the Winter Olympic. From their creepy cheerleaders to Kim’s sister, Kim Yo-jong, it was puff piece and whitewash central for the news media. The media was lockstep: Who cares if North Korea has an appalling record of human rights abuses, they don’t like Trump, so let’s go with that angle. In doing so, the news media ignored that past cheerleaders were sent to prison camps for talking about what they saw in South Korea. Some publications had the temerity to suggest that the communist state, and world’s largest prison, won the “diplomatic gold.” Oh, and Kim’s sister gave Vice President Mike Pence the death stare, which is fine because he doesn’t like gay people. Our athletes we sent also weren’t happy to represent the U.S. They made their feelings known. And they all failed miserably. From the speed skater who complained about the coin toss that denied him the honor of being the flagbearer to spazz attacks over anything related to Trump from our atheletes we sent to South Korea, all of them failed. The U.S. had their worst showing in years, maybe we should call it the Trump curse, but back to the media acting like morons, only BuzzFeed, of all publications, were the ones who noted that North Korea enslaves its own people, have gulags, made a note that Kim’s sister is part of the Propaganda and Agitation Department, that her brother probably killed his half-brother with VX gas, and North Korea has been blamed for the death of U.S. college student Otto Warmbier. Welcome to the liberal media in the age of Trump, where nations with egregious human rights abuses get the massage parlor treatment. If anything, that the fact that these talks are even happening is a win for Trump since, let’s face it—no one thought this was going to happen. Also, this news should give more urgency to confirm Pompeo, who could be heading for the rough, as Democrats begin to line up against his nomination. Funny how this dropped right about now, huh? Will the Left endanger us to ensure a Trump nomination defeat? I wouldn’t put it past them. "I will oppose that nomination. I believe that Director Pompeo has shown a disdain for diplomacy putting military action at a higher priority."